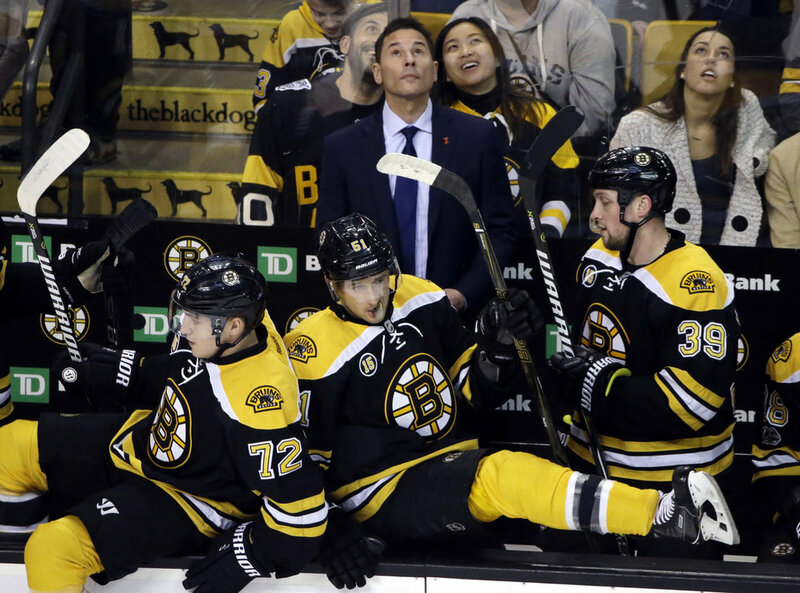 The Boston Bruins lineup for this upcoming season looks to have some things in place, but others in question. There are a variety of answers to these questions that can be solved by a number of different players, some we may expect more than others. It all depends on what direction the team wants to go in and what message, or messages, they want to send to their opponents. One way Don Sweeney could decide to go when helping form the roster for Bruce Cassidy and the coaching staff is via trade. Three guys that particularly stand out as fairly realistic trade candidates are Ryan Spooner, Frank Vatrano, and Adam McQuaid. One underlying reason as to why Vatrano and Spooner have value is the fact that they are left-handed players that have shown that they can score to some degree. Sure, Frank Vatrano has done most of his scoring in Providence, but the potential is still there with his speed, bulldog mentality and impressive shot and release. With some work on his consistency on the score sheet, he could be a fine NHL scorer someday. Some teams that come to mind in this situation are the Los Angeles Kings, Anaheim Ducks, Vancouver Canucks, Vegas Golden Knights, New York Islanders, and New Jersey Devils. The Kings, Ducks, Canucks, and Islanders have all been speculated to have been looking for a left-handed player that can score in the past. Spooner and or Vatrano could be of interest to these teams and possibly others in this case. Teams like the Los Angeles Kings, Vancouver Canucks, and New York Islanders have had reported interest in Buffalo Sabres forward Evander Kane. Those three teams are teams that could use a guy with the potential to fit into a top-six scoring role on the left wing. Kane is a left-handed forward with scoring potential. The Canucks, Golden Knights, and Devils were all reported to have some interest in Ryan Spooner in the past. Spooner isn’t as much of a scorer as he is a playmaker, but that doesn’t mean he wouldn’t have interest to a team looking for scoring. He is effective on the half wall on the power play as well. Spooner has registered 64 assists in 158 regular season games over the past two seasons without playing a ton of top-six minutes, a lot of his minutes have been bottom-six and powerplay minutes. His power play prowess, puck distribution skills and skating ability are the main qualities that could catch the eye of general managers across the league. Spooner’s trade value is up-in-the-air partly because he is a restricted free-agent waiting for an arbitration hearing. His hearing is set to take place July 26, less than a week from today. What Spooner could fetch in return is up in the air. A right winger could be acquired for the top-nine, some have thrown out Arizona Coyotes forward Anthony Duclair’s name. Duclair is listed as a left-wing, but might not have too much of a problem playing on his off wing. Spooner and Duclair are both restricted free-agents who could benefit from a change of scenery. Honestly, a Spooner for Duclair swap almost makes too much sense. There’s also the possibility they trade Spooner and maybe more in hopes to acquire a top four defenseman or a draft pick or two. Sami Vatanen may make sense as a right-handed option, but the Bruins would likely have to add more than Spooner or Vatrano. The Bruins currently have five right-handed defensemen and only two left-handed defensemen on the roster. Maybe Adam McQuaid could be packaged in a deal with Ryan Spooner. Rob O’Gara and Matt Grzelcyk are realistic left-handed defenseman who could make the jump this year. This could just mean Spooner is traded for a forward or a pick or two instead of a defenseman. A decision to make room for O’Gara or Grzelcyk could provoke Don Sweeney to move Adam McQuaid because he is right-handed and is a very similar player to Kevan Miller. Kevan Miller really took a big step last year, especially in the playoffs. It’s fair to say that McQuaid is more likely to be moved than Miller. Trading Spooner or Vatrano makes room for a young player trying to solidify a roster spot. Trading McQuaid could do the same, but for a young defenseman. One change that may be flying under the radar would be making David Backes the new third line center. Hear me out, I’m not completely ruling out Jakob Forsbacka-Karlsson being there. There is also the rather unlikely possibility of Ryan Spooner returning on a new deal to compete for minutes as the third line center. David Backes played center in ten seasons as a St. Louis Blue. He played on the right wing a lot this past season in the top-nine and looked out of place at times. Moving Backes to play third line center could have some benefits. He isn’t known to be the best skater, although he isn’t necessarily a bad one and he is 33-years-old. It looked difficult for him to keep up with the Bruins top-six forwards at times. There are a good amount of guys that he could play realistically with on the third line, some more realistic than others. Those guys are Anders Bjork, Danton Heinen, Frank Vatrano, Matt Beleskey, Zachary Senyshyn, Peter Cehlarik, and Jake DeBrusk. The young guys on this list don’t necessarily need to play top-six minutes right away to succeed. Say the third line ends up consisting of Jake DeBrusk, David Backes, and Anders Bjork. That sounds like a well balanced third line. A veteran in his natural position in the middle with two young, hungry wingers with a lot of skill that he can make plays with. Whoever doesn’t play on the third line will compete for spots on David Krejci’s wings, depending on whether David Pastrnak starts out playing with Brad Marchand and Patrice Bergeron or not. If Pastrnak does play with Krejci to start, in this situation, a young player will have a golden opportunity to start out on the first line. That’s not bad considering that player will get to skate alongside a guy who made a great case for the Hart Trophy, Brad Marchand, and a four-time Selke Trophy winner, Patrice Bergeron. There is the more unlikely option that they bring in a right-wing to play on the third line or in the top-six. Alex Chiasson and Thomas Vanek are two names that come to mind. At this point, it sounds like the direction the team is heading in is one revolving around youth, which isn’t bad. Matt Beleskey may make sense as a guy who has similar speed to Backes. Beleskey seems very eager to get back to his old ways like we saw in the 2015-2016 season where he had a career-high 37 points. It would be difficult to do that being stuck on the fourth line, although the fourth line could be dangerous with Riley Nash and Noel Acciari likely holding down the center and right wing positions. If Backes does, in fact, start on the third line, Jakob Forsbacka-Karlsson, could play on the fourth line with Riley Nash, Noel Acciari or Sean Kuraly on his wings. If that’s not the case, some AHL seasoning for a bit would not be the worst thing for JFK. The NCAA and NHL games are very different. There are so many possibilities for what kind of lineup the Boston Bruins will roll out to start the 2017-2018 season. These tough decisions will come to fruition once we hit camp season, as well as the preseason.